Penn State quarterback Trace McSorley was an all-Big Ten second-team choice last season. 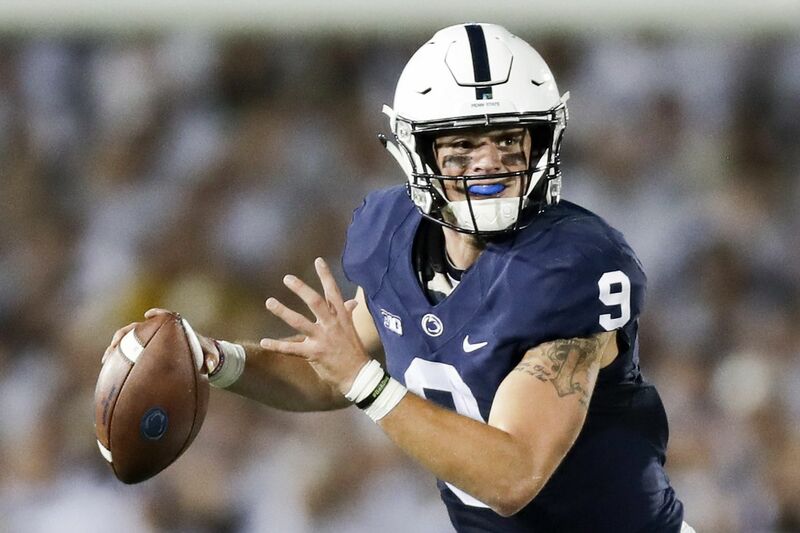 CHICAGO – Penn State quarterback Trace McSorley was a unanimous selection to the list of 10 players named Monday as Big Ten football preseason honorees. The 6-foot, 203-pound McSorley, a senior who gained preseason honors for the second straight season, is one of seven players in Big Ten history to have back-to-back 3,000-yard passing seasons. Last year, he completed 66.5 percent of his throws for 3,570 yards and 28 touchdowns, rushed for 11 TD, and was named second-team all-Big Ten. He enters the 2018 season with at least one touchdown pass in 28 consecutive games, the longest active streak in FBS. McSorley already holds Penn State career records for completion percentage (61.8 percent), passing touchdowns (59) and total offense (8,268 yards). The preseason honorees list, selected by a media panel and announced before the start of Big Ten football media days, also included Salem (N.J.) High graduate Jonathan Taylor of Wisconsin, the league freshman of the year last season.